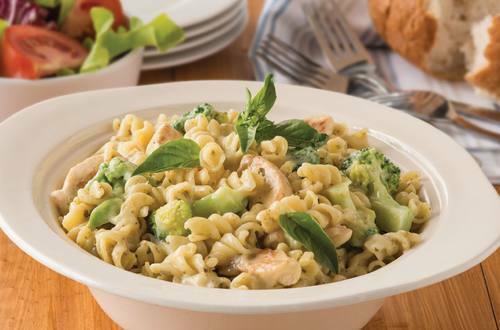 Create a taste of Italy with our chicken and pesto pasta recipes. Perfect for friends or the whole family, prepare and cook this dish in just 20 minutes. Serves 3-4. 2 Add Pasta & Sauce, milk, water and broccoli and bring to the boil. Simmer for 10 minutes, stirring regularly. 3 Stir through pesto at the end of cooking.